Imagine flying for 4 hours and still being in the same country! Argentina is huge, in all directions, and here I am going to the southernmost tip, literally the end of the world before you get to Antarctica. 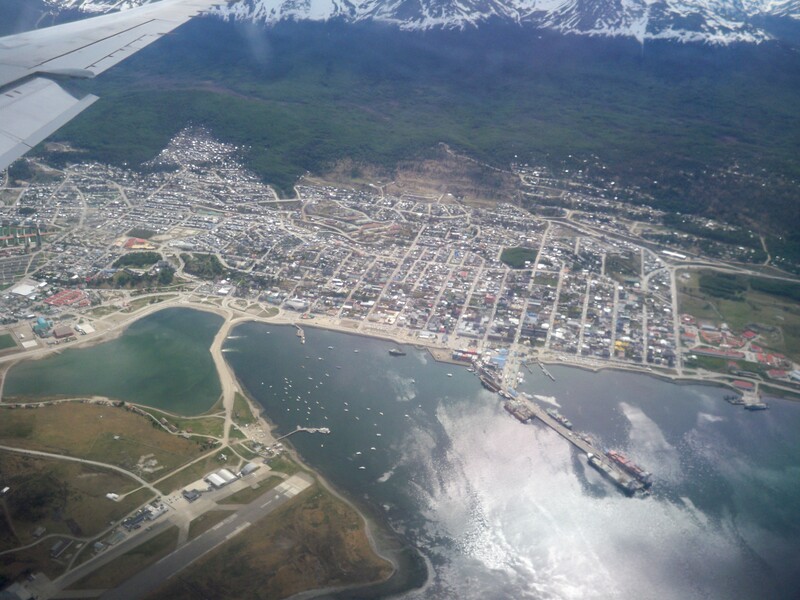 Located on the Beagle Channel, along which Darwin made his famous voyage, Ushuaia is the largest urban area (64,000 people) on the Argentinean side of the main island of Tierra del Fuego and the southernmost city in the world. Once a penal colony it has reinvented itself as a tourist town and ski resort. A lot of the people that throng San Martin, the main shopping street, or packing the fifty plus restaurants in the town, are from other countries. Even the Argentinean population aren’t generally local but have come here to work from other areas of Argentina (there are no taxes to encourage people to settle). English is the lingua franca in town and a lot of people speak it very well. Although in theory I was here in summer (17C is considered warm), we regularly got all four seasons in one morning, alternating between rain showers, glorious sunshine, occasional snowflakes and small fierce gales that blow themselves out in a matter of minutes. Locals say you have to dress like an onion and be ready to put on or shed layers at any given moment. If you’re up early, the morning skies can be incredible with bizarre, beautifully-coloured cloud formations. The centre of town is based on a grid system so it’s fairly easy to get around, although house numbers sometimes inexplicably jump up for no reason. For city maps and excursion info, the Tourist Information is on the corner of San Martin and Juana G.Fadul. Their webpage has a list of addresses for all the restaurants in town. You can also get them to put a special Ushuaia stamp in your passport for free. The post office is on the corner of San Martin and Godoy. I was here for six days in all, but only had one day off, so didn’t get to do many of the possible activities, other than eat a lot. I’d missed the main penguin watching season (best in winter when there’s more of them around) so decided to give the catamaran boat trip down the Beagle Channel a miss. Walking in the nearby National Park would have been a good option too but I really fancied going to see the local glacier (there are more than 40 on the Argentinean side of the main island) so I hired a guide to take me trekking. Sebastian or ‘Seba’ was a really nice guy and as a certified guide, knew his stuff. He is a member of a group of professional guides called Guias del Sur who can arrange different expeditions, including a gourmet trek! Sadly this option wasn’t available the month I was in town. The medium level trek up the Martial Glacier (aka Bat Wing Glacier) took just over three hours to get to the top and a bit less than that to get down again. 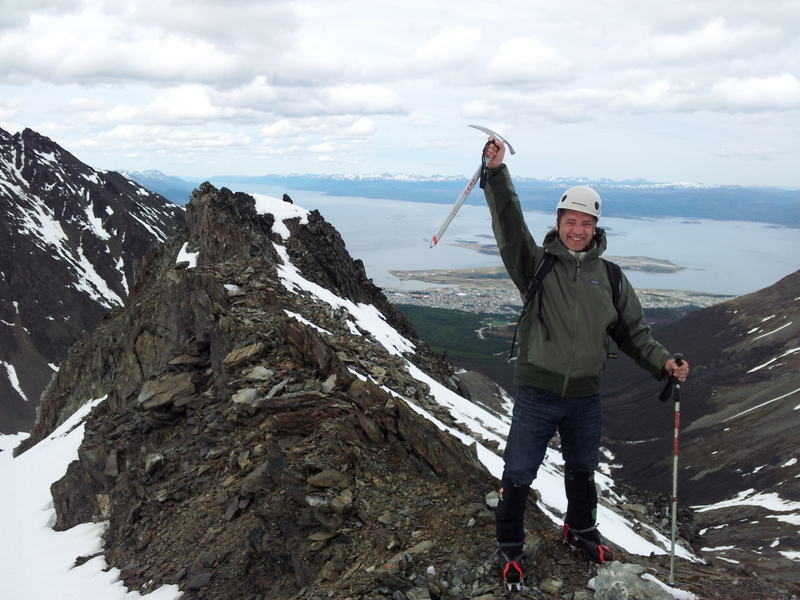 We tackled it in three stages, the first with me following in Seba’s footsteps in the soft spring snow, or where possible over the exposed moraine screes. Starting off, we each had a walking pole for extra stability. The second stage was in deeper snow where we also put on leg coverings to keep the snow out of our boots and stop us spiking ourselves later with the crampons. Seba stamped in each footstep twice to give me a stair to put my weight on. This didn’t always help though and we would frequently both sink into the snow to above knee height. Before the final stage we stopped for lunch by the weather station and its bizarre devices for measuring snowfall and wind speed. After all that climbing the plain cheese and salad sandwich tasted amazing! We washed it down with a couple of cups of sweet mate (maa-tay), the quintessential national brew. I’d never liked it before but up here it tasted heavenly. I’m sure the view and the super-fresh air added to the flavours! The third stage was the glacier itself which required crampons, a helmet and an ice pick to drive into the surface if we started sliding. You could see some of the ten thousand year old ice peeking through but most of it had a thin covering of snow that could be very slippy. This time I was in the lead so Seba could catch me if I skidded off. Thankfully this didn’t happen! The view just kept getting better as we ascended and the final vantage point on a razor sharp ridge was just simply stunning. The way down was much easier of course, it felt almost that we could run back down, except our legs regularly kept disappearing up to waist height in snow drifts! Of course at the end of the world, there’s an Irish pub (Dublin at 9 de Junio 168) which has the best craic in town (there are night clubs but they are crap apparently). Personally I don’t share the opinion that so-called Irish pubs should be avoided on principle. At the end of the day, this is where all the characters (pissheads) are most likely to be, whether local or tourist, and it was full to bursting at the weekend. I had a Pisco Sour smoothie (cocktails not a speciality) and on another evening I sampled one of the local Fuegian beers, draught Beagle blond, which was slightly less disgusting (C+) than the Austral also on offer. Maybe the red or dark varieties are better. So, a great for meeting people if you’re a solo traveller like me, but I’ve yet to find something I’d want to drink regularly here. But they do have Wi-Fi. Another bar for more peaceful post-prandial drinking and blog writing is Ramos Generalis, a century-old corrugated tin building (like many places here) down at 749 Maipu. This is also a good place to come for a chocolate penguin (the nearest I got to a colony) or a fruit tart (B+), amongst other attractive looking sweets, and a digestif. NB when asking for this you will get tea unless you specify alcohol! I recommend Legui, an Argentinean herb and caramel flavoured liqueur, drunk in a wide glass with a lump of ice. Ramos Generalis has a peaceful, friendly atmosphere with low lighting, restrained ambient music (if anything too quiet), lots of wood and an impressive collection of paraphernalia on the walls. Their locally brewed Cape Horn draught pilsner was foul to the point of being undrinkable (D) however they kindly changed it for the marginally better Austral (C). Stick to wine and spirits here too. I stayed at the Hosteria Patagonia Jarke, an unsophisticated but pleasant hostel with clean, spacious rooms, satellite TV (although no English programming except Warner soaps) and free Wi-Fi. The breakfast is a bit basic but they do have fresh fruit. The staff are friendly, especially the English-speaking Diego who took good care of me during my stay and made me feel very welcome. 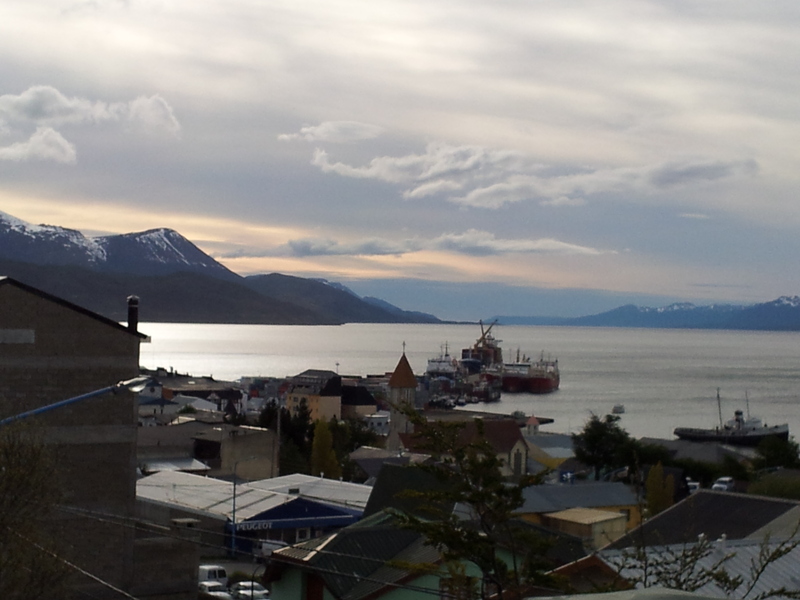 See the other posts on Ushuaia for my food adventures. 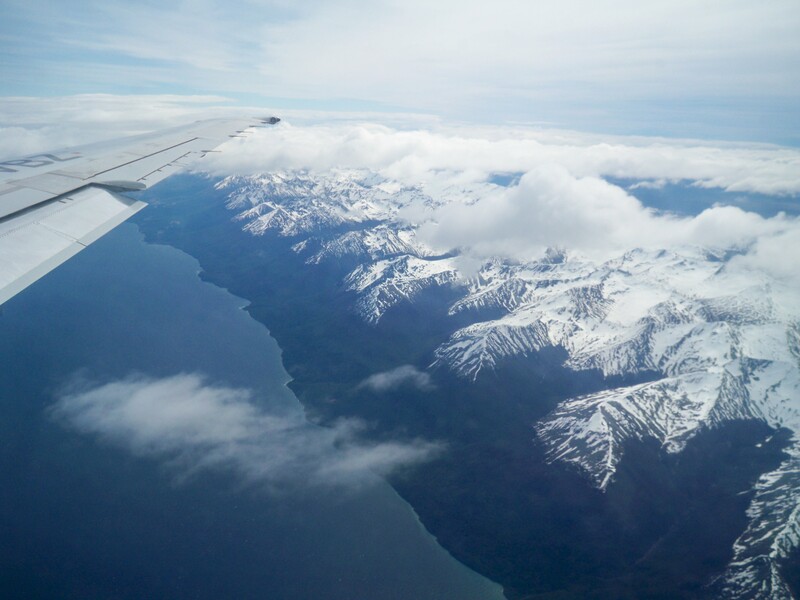 This entry was posted on November 11, 2011 at 2:52 am and is filed under Argentina, Tierra del Fuego, Ushuaia with tags Guias del Sur, Hosteria Patagonia Jarke, Martial Glacier, Ramos Generalis, Ushuaia. You can follow any responses to this entry through the RSS 2.0 feed. You can leave a response, or trackback from your own site.